Teachers: Don’t let ’em go! The seemingly harmless act of collecting tadpoles from a pond for nature study and re-releasing them after metamorphosis could actually contribute to the spread of a fatal frog disease, amphibian chytrid fungus. We want to be sure that schools, parents and students are aware of the risks to local amphibians and do NOT spread this fungus by moving or releasing frogs to the wild. NEVER release a frog or any other amphibian into the local environment even if it came from there in the first place! The study of amphibian metamorphosis is an integral part of nearly every K-8 curriculum. At this time of year some schools bring tadpoles into the classroom to watch metamorphosis in action. Frog eggs and tadpoles, commercially available online from science supply companies, can be carriers of Batrachochytrium dendrobatidis (Bd or chytrid for short). This disease spreads easily and is rapidly fatal to many native amphibians. Unfortunately, many of these companies advise customers to simply release the frogs to the wild. This is not only illegal in some states, but dangerous. To prevent the spread of chytridiomycosis, consider studying tadpoles in a pond without bringing them back to the classroom. 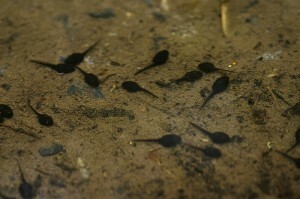 If you are collecting or purchasing tadpoles or eggs, make absolutely sure that: 1) it is legal – permits are required in some states; 2) the tadpoles are kept by themselves and never mixed with any other tadpoles or frogs or water that has been with other animals; 3) you are prepared to care for the frogs for the rest of their lives or can find appropriate captive homes. So, only raise as many as you can re-home responsibly or care for yourself. Some companies, (e.g. Grow-a-Frog) will welcome your frog back and provide shipping bags. If you have no other options please call your local zoo, state wildlife department or nature center. If planning for care of native frogs in the classroom post-metamorphosis, please take into consideration that in nearly all cases you will need to provide a steady diet of live insects as most native frogs only eat live food. Most native tadpoles have relatively easy care requirements, but most native frogs have very demanding care requirements. You need to consider whether you are committed to providing the special requirements and steady diet of live, moving insects for the frog’s entire lifespan. If so, this can be a wonderful thing for students to participate in. The release of any animal, captive, non-native or native, into your local ecosystem is a serious cause for alarm. Now more than ever, it is imperative to inform your students about the global amphibian extinction crisis and risks of releasing any animal and especially any amphibian into your local ecosystem. Pure and simple: Don’t let ’em go ! Survival of amphibians and the well-being of our environment depends upon what your students learn now. You can and will make a difference for future generations! To help educate students about the immediate global concern for amphibian extinctions please see this link for curriculum materials.